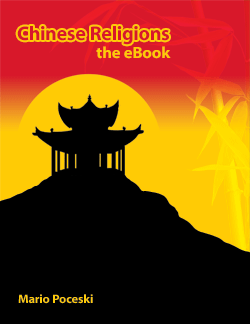 Chinese Religions: the eBook serves as a comprehensive yet accessible historical survey of Chinese religions. It covers the whole spectrum of Chinese religious history, providing a thorough and balanced coverage of major developments, texts, traditions, beliefs, practices, and institutions. The book adopts a combination of diachronic and thematic approaches, starting with an exploration of the earliest forms of religious beliefs and practices in ancient China, and ending with a discussion of present-day trends and predicaments. A substantial part of the book focuses on the three main Chinese religious traditions—the so-called “three teachings,” namely Buddhism, Confucianism, and Daoism—each of which is allocated two chapters. However, other relevant traditions—such as popular religion, Christianity, and Islam—also receive adequate coverage. While separate chapters are dedicated to the main traditions, throughout the book there are also discussions of the mutual influences and intersections among the diverse religions, and the models of religious pluralism that evolved in the course of Chinese history. The book also considers the ways in which religious traditions interact with other social forces and cultural phenomena, such as political authority, literary production, and artistic representation.